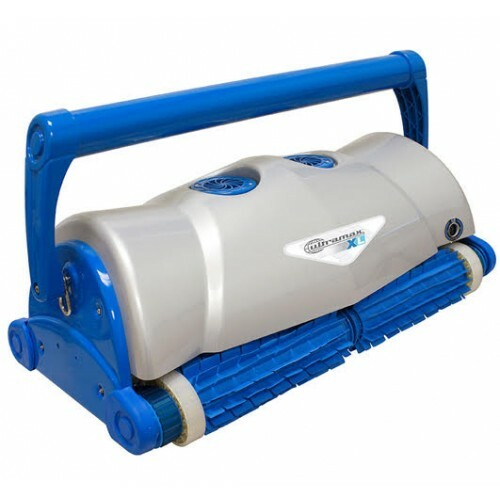 The Ultramax and Ultramax Junior are the most technologically advanced, easy-to-use commercial pool cleaners available in the market. All you have to do is place the lightweight Ultramax into the pool (no hoist is required), plug it in to its power supply and the cleaner will do the rest for you..
From the reliability of its mechanical and electronic systems to the toughness of its ABS housings, The Ultramax has been engineered to require little maintenance and give you years of faithful service. If your Ultramax is to be used in its "automatic" cleaning mode in a pool with a Zero depth end, the cleaner can be equipped with a zero-depth sensor. This option senses when the unit is no longer fully submerged in water and reverses the direction of the unit. The Air Sensor is available only on the Ultramax (not Ultramax Jr).. These are special brushes, designed for use in polished tile pools. Technical Specifications - UltraMax Jr.
Electrical Cord Length: 120 ft. Shipping Dimensions: 20" x 14.5" x 13"